A light grey fin silently emerges from beneath the surface of the water, slicing like a knife through the waves. Its approach is direct and deliberate as it heads straight for its target: a boat filled with oblivious teenagers. Their joyous revelry is drowned out by the building crescendo of the orchestra. The boat pitches wildly. Screams fill the air. And then there is only silence as blood fills the water. A great white shark’s voracious appetite has been sated with the flesh of humans, once again. Such is the drama of your typical shark movie, courtesy of your favourite Hollywood director. And the picture it paints of the shark is one of a man-hunter. Even a cursory glance over the statistics collected on shark attacks seems to bear this out. Reports of shark attacks are on the rise. Humans, it seems, are now on the menu of many sharks. But according to a marine researcher at the University of California at Davis, this view is just plain wrong. Peter Klimley has been studying the feeding habits of the great white off the California coast and has arrived at a large number of surprising conclusions. Among them are that great whites are social creatures. By tagging them with small transmitters and tracking their movements with Vancouver-made sonar buoys, he’s been able to show that sharks frequently move in pairs and often return to the same spot in the ocean. He’s also documented an odd behaviour in sharks of slapping the ocean’s surface with their tails during feeding. This slap, Klimley thinks, sends a clearly audible signal to other nearby sharks to stay away while it is eating. This isn’t an act of aggression, he says. Instead, it is a way to prevent several sharks from feeding at the same time and biting each other. 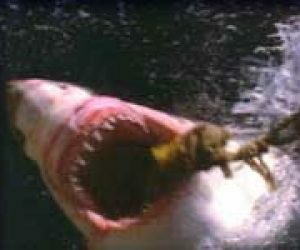 He’s also found out that sharks don’t quite possess the insatiable appetite we’ve made them out to have. 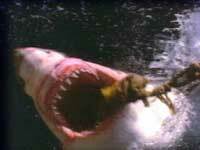 He managed to put a thermometer attached to a transmitter into the belly of one great white shark. If it ate anything warm-blooded, the thermometer would have detected a noticeable rise in the temperature of the shark’s stomach. To his surprise, the shark didn’t feed on anything warm-blooded for 12 days. 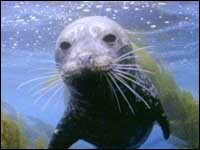 If humans aren’t on the white shark’s diet, seals certainly are. But the finding that most people will be relieved to hear is that humans just don’t appear to be on the white shark’s diet. The reason? We’re too darned slim. “They’re not eating birds, they’re not eating humans, they’re not eating sea otters. These are things that are all lean. But they are eating seals and sea lions and when they’re scavenging on whales, they’re only eating their fat — not the rest.” This has led Klimley to the conclusion that the sharks are solely interested in eating things that will give them the greatest energy. And that means going after sea mammals that have plenty of blubber. Unfortunately, white sharks do sometimes attack humans. But Klimley thinks it is a case of mistaken identity.